Bryan Norcross, as described in 1992 by People magazine was, “the man who talked South Florida through.” Bryan’s four part story will offer his unique perspective as chief meteorologist for Miami’s NBC station WTVJ during the biggest weather event in the city’s history. Highlights include the initial forecast and his recollections of decisions he made on air throughout the night that possibly saved thousands of lives across South Florida. In 1992, computer models arrived in our TV weather office on the slowest printer-like apparatus you could ever imagine. Friday afternoon I waited and waited for the forecast upper-air charts from the relatively new AVN model covering the next three days. The information in those maps would guide my message that afternoon. How big a threat might Andrew be, and what action should we be ready to take over the weekend? When the maps finally arrived, I could see that the high-pressure system to our north was not just going to stay in place; it was forecast to strengthen and move west over the path of the storm…an ominous trend. That strengthening high meant that there was some chance that Andrew would stay south, and that could mean trouble for us. The model didn’t forecast the path of the storm; it only forecast the general pattern and upper flow. I made a judgment based on the upper-air pattern the AVN model was presenting that the risk was high enough that we needed to raise the possibility that Andrew could become a serious problem. So, at 3:30 pm I went to Sharon Scott, who was in charge of the news at WTVJ-TV, and told her we needed to “raise a red flag” beginning on the 5 pm news. I wanted people to know that there was a chance that we might have to deal with Hurricane Andrew over the weekend and it could be significant. The late afternoon advisory from the National Hurricane Center did not cause a big concern. The new official forecast kept the storm reasonably far away from South Florida. The other television stations more or less conveyed the message that Andrew wasn’t a threat for the weekend, while we were running hurricane preparedness stories and expressing concern about the potential threat. 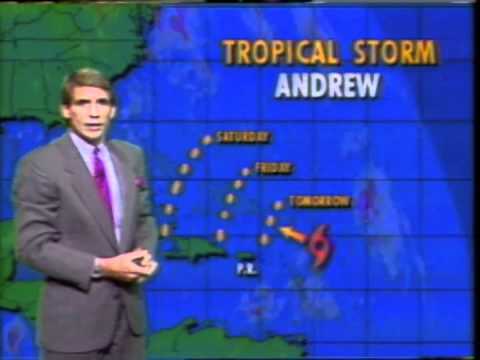 By the 11 pm news, the possibility of Andrew affecting South Florida was more widely discussed on the various broadcasts, though the Hurricane Center forecast still showed the storm bending north. This entry was posted in Hurricane Andrew Stories, Uncategorized by federalalliance. Bookmark the permalink. thanks for sharing in the above post. it’s nice to share this information. looking forward to reading more. your post is so valuable for me, it will help in lots of ways. very good info that is presented in this post. i prefer to read this kind of stuff. the quality of content is fine and the language is interesting. thanks for your kind support.